If you’re looking for me during the months of October, November, December and January, I’ll be hosting home birthday parties for our four kids. That’s high-level family planning right there. The boys have tried to convince me that we need a February but I’m using my strong no vote. 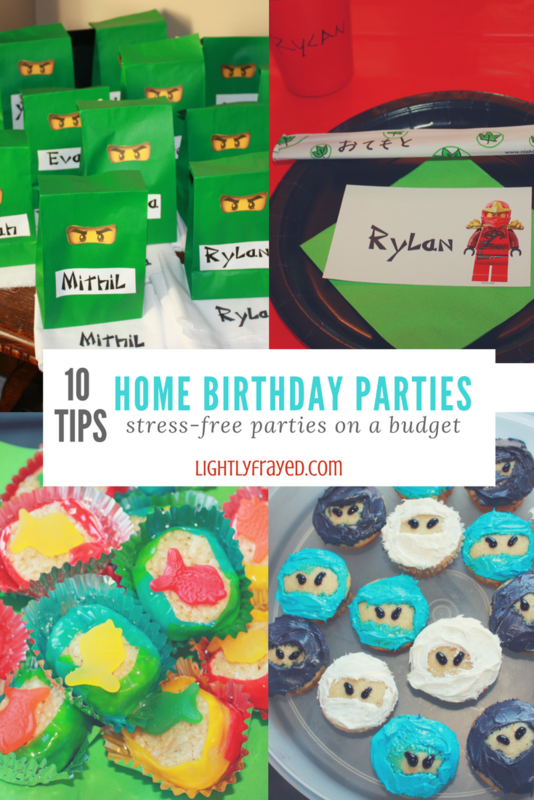 Over the years, we have become masters at hosting stress-free home birthday parties. We have it down to a simple system that works for any age or theme. The best part? It doesn’t have to break the bank. Each year, all four home parties cost about the price of one party away at a venue. Maybe even less. Kids love to choose their birthday party theme and it helps anchor the rest of the planning. We have done many themes over the years including: Superheroes, Jungle Animals, Minute to Win It, Lego, Rocks and Minerals, Escape Room and Mario. Be sure to not select the theme too early as children change their favourite characters faster than they can put on their shoes. A recent Super Mario party was almost a Sonic/Charlie Brown/Veggie Tales party, depending on the day you asked the birthday boy. I often omit this step and regret it as soon as I come home with duplicates. Keep a small bin labelled Party Supplies with leftover balloons, streamers and plates. Inventory what you have and make a list of what is needed before heading out. If you’re not careful, the cost can skyrocket, without much to show for it. Instead, choose a few low-budget items that will have high-impact. To save money, buy a mixture of themed items with plain ones. This is my favourite part of party planning. Having a theme helps narrow down an internet search for games. But I still recommend setting a timer so you don’t spend hours scouring ideas. Avoid becoming overwhelmed (or daydreaming about Asian cuisine in this case). Know when to walk away. How many times have you scrambled around trying to snap pictures of each guest during party mayhem? No more. Get a picture of every guest as they enter. Keep it simple. Have a few props or costumes by the front door. As each guest arrives take a picture of them with the birthday child. 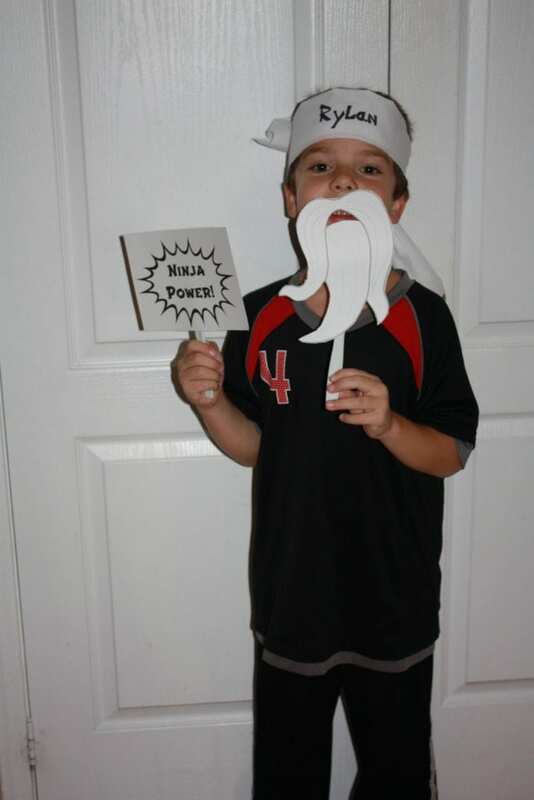 Headbands were customized with a black marker and ripped white cotton strips. Easy! 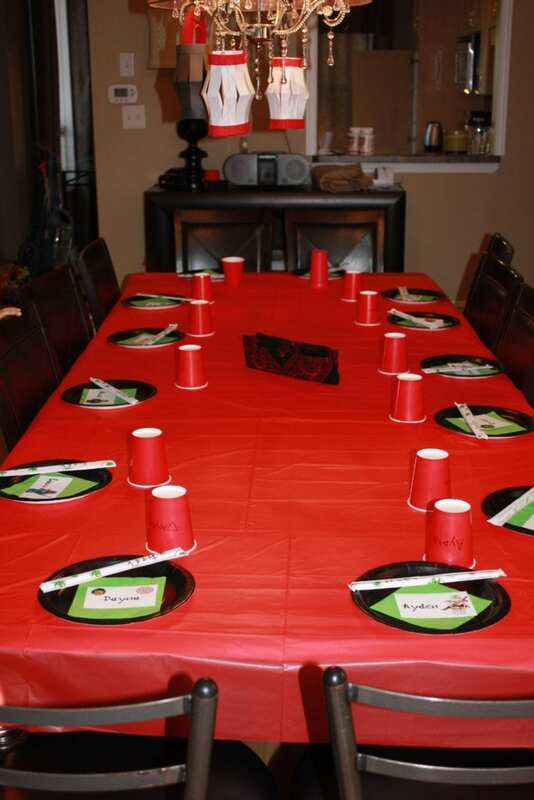 This is another fun way to bring the theme into your budget-friendly party. 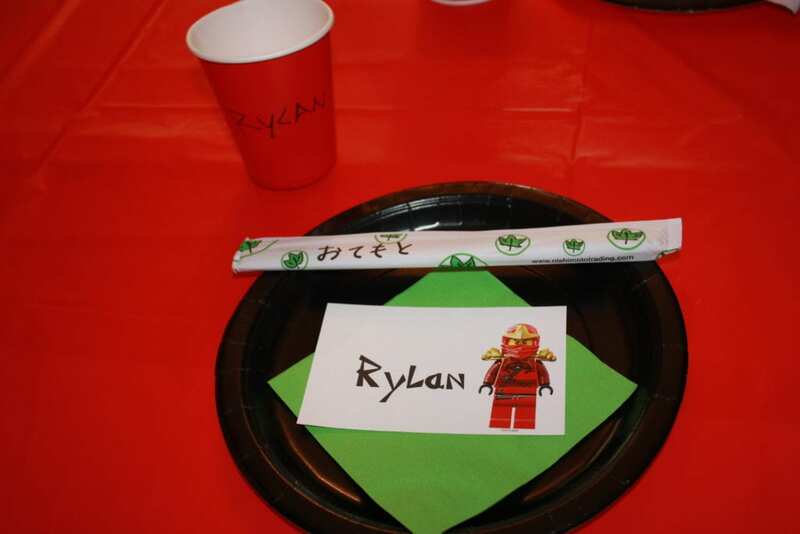 Dessert was Ninjago-shaped chocolates and rice krispie sushi with fish candy. I usually plan on running 3 organized games, but I have another few on the back burner in case the crowd gets restless. I also recommend having an unstructured activity (like Lego) that introverted kids can gravitate towards. Decorations can be another budget buster, but they don’t need to be. We make our table the focus of decorations since that is another easy time to take pictures (when little ones are actually sitting still). We scour the house for items we own that fit the theme. Construction party? A Tonka Truck will display the Dirt Cupcakes. Duplo party? Make chip bowls out of Duplo. Martha Stewart I am not so I make cupcakes for two reasons. They are so quick and easy to serve (with a side of ice cream) and they are much more forgiving when the kids and I decorate them. If the eyes are crooked, they look charming and not terrifying because they are on cupcakes. 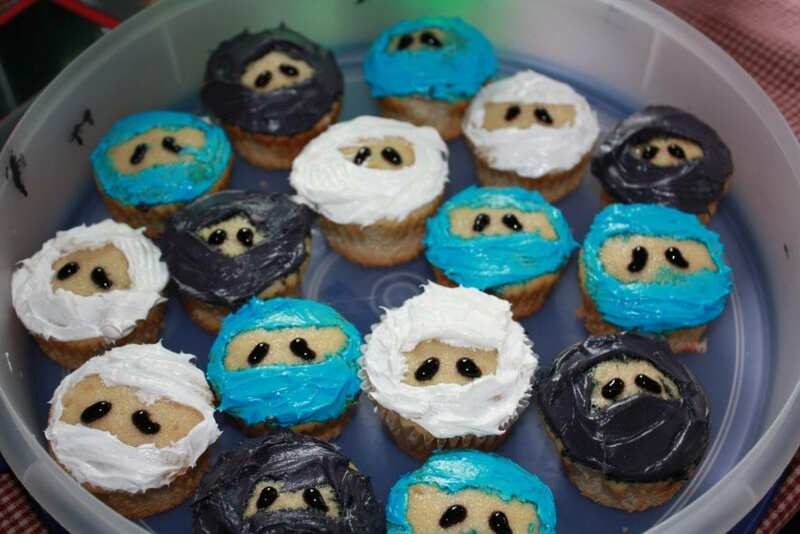 I searched <easy Ninjago cupcakes> to eliminate the over-achiever version. 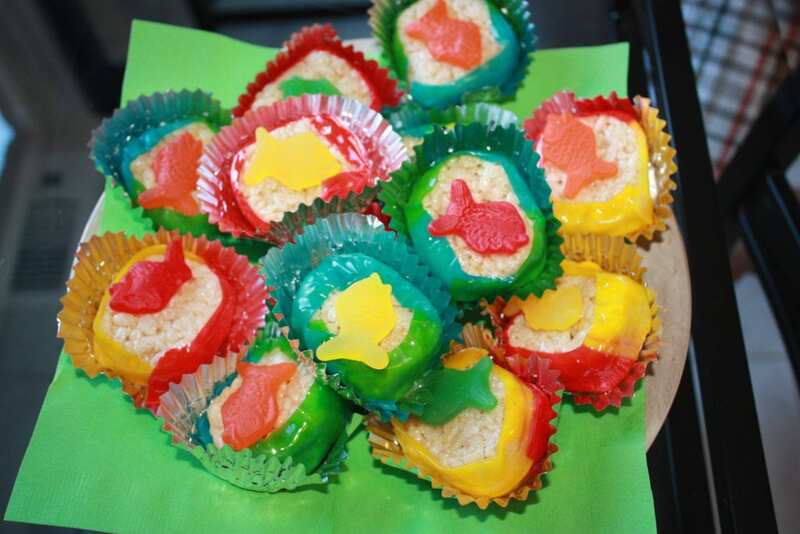 If you squint hard, these are almost Pinterest worthy. Moving along…. We have done a variety of thank you gifts for guests including small gift cards, large chocolate bars wrapped up or loot bags. My kids love assembling the loot bags, and it is a fun way to incorporate the theme further. I shop for items throughout the year for things to include inside. 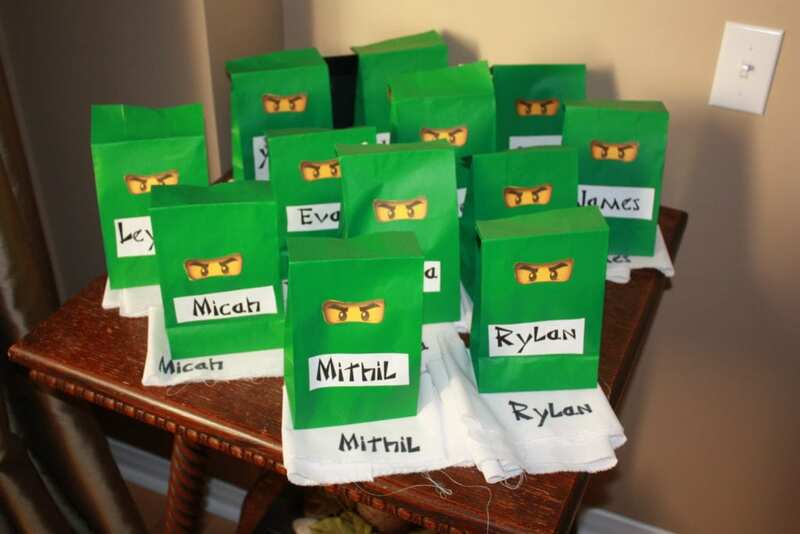 These were super easy using green bags, printed yellow eyes and customized name tags. Try not to be so exhausted, or consumed with everything perfect, that you miss having fun. Yes – it will be loud and crazy. Yes – you may be weary. But these are precious memories that you will want to savour. Why not ask a friend to be your party assistant, and you do the same for her? No money in the world can every repay that kind of help when it is party day (grateful shoutout to my Birthday Ninja Mom Friend). Don’t forget to set up these clothespins to get the family helping at clean up time. 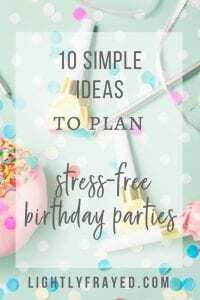 Hope these ideas help you create the easiest home birthday party that you and your child will remember for years to come. Questions or suggestions? Pop over to the facebook group to ask away! That is one thing I have never had a chance to do – a party for a girl! None of my cupcakes will ever make it onto Pinterest, but they look a whole lot better than any cake I have ever attempted. I hear you, Christie! We have 4 boys and their birthdays are Oct, Nov, Dec and Jan. You can imagine how I have to push myself to celebratie January well. I may have tried to bribe him into a really special day with 1 or 2 friends instead – he didn`t go for it…. LOVE the tub of icing idea! Nothing wrong with a copycat party – I think any parent who does a single home party is a superhero.